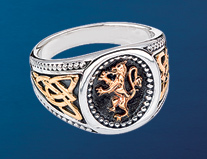 The lion rampant, the royal emblem of Scottish kings, makes an adornment of quiet distinction. Golden lion and eternal knotwork gleam against dark oxidized silver, trimmed with polished silver for a statement of elegant nobility. Sterling and 10k gold. Designed by Keith Jack. Sizes 5-15. Another fantastic ring from cousin keith! !